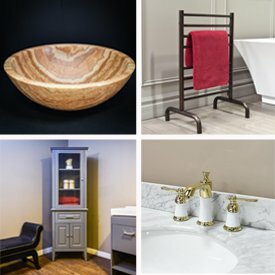 Make a stylish statement by upgrading your bathroom sink. Our shop includes a variety of different styles including undermount and vessel basins. Complete your bathroom look by complimenting your countertop with the right type of sink. Learn about Luxury Living Direct's custom vanity program. If you see a sink below that matches a vanity or piece of cabinetry that you like, give us a call at 1 (800) 574-3022 and we'll give you a quote!